The administration at American University must have felt so strongly about this that they failed to spell check their own title. However, their hearts were in the right place. For more of my coverage on the Chicago Letter, read here! The text of the entire resolution is below. I will update this story as I get more information, including the full text of the email. Freedom of speech–protected by the First Amendment to the United States Constitution– undergirds the cherished principle of academic freedom. As limits, either subtle or explicit, are increasingly placed on intellectual freedom in venues of public discourse, the academy is committed to the full expression of ideas. 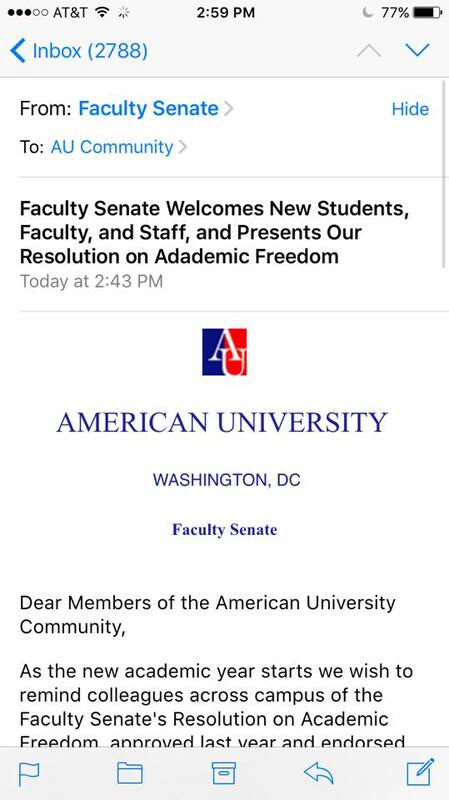 American University is committed to protecting and championing the right to freely communicate ideas—without censorship—and to study material as it is written, produced, or stated, even material that some members of our community may find disturbing or that provokes uncomfortable feelings. This freedom is an integral part of the learning experience and an obligation from which we cannot shrink. As laws and individual sensitivities may seek to restrict, label, warn, or exclude specific content, the academy must stand firm as a place that is open to diverse ideas and free expression. These are standards and principles that American University will not compromise. Faculty may advise students before exposing them to controversial readings and other materials that are part of their curricula. However, the Faculty Senate does not endorse offering “trigger warnings” or otherwise labeling controversial material in such a way that students construe it as an option to “opt out” of engaging with texts or concepts, or otherwise not participating in intellectual inquiries. Faculty should direct students who experience personal difficulties from exposure to controversial issues to resources available at American University’s support-services offices. In issuing this statement, the Faculty Senate affirms that shielding students from controversial material will deter them from becoming critical thinkers and responsible citizens. Helping them learn to process and evaluate such material fulfills one of the most important responsibilities of higher education.